Last Monday afternoon I received an unexpected email. Seems Pontiac is back. 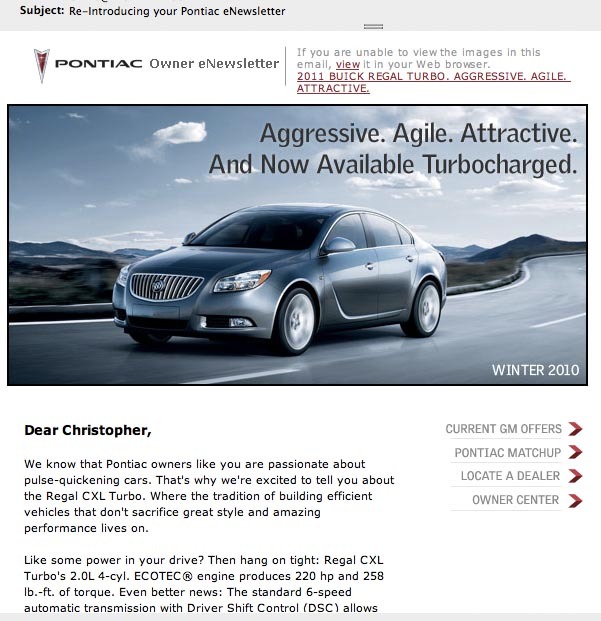 Well at least the former Pontiac eNewsletter is back and it no longer has a new Pontiac to sell me, but someone at General Motors feels a new Buick Regal is the new GM's answer to Pontiac. I suppose the Regal is the right answer, since it is trying to position itself as a sports sedan capable of reigniting "Excitement!" It's an interesting play with Pontiac owners/leasees probably on the hunt for a new car and GM obviously wants to keep Pontiac owners in the family so with the new Regal there is a decent replacement for these customers. The email also promoted service for Pontiac owners and a new mobile app available for 2011 Buick, GMC, Chevrolet, and Cadillac models. It will be interesting to see how or if the Pontiac eNewsletter will promote other GM vehicles or if it will try to move Pontiac owners to the Buick brand. The regal is not rear wheel drive. Its front wheel drive. Thank you for the correction. I've had so many talks about the Regal and read so many reviews but for some reason thought it was RWD with the way people talked about it. Sadly it's FWD and AWD. So much for "We Build Excitement"
Pontiac is a very famous brand of automobiles in US, Canada and Mexico. The producers of Pontiac automobiles are General Motors. They are producing and selling their vehicles in US, Canada and Mexico since 1926. Ooooh They called you Christopher! How can you not buy one now? Would You Pickup this Hitchhiker in Your Benz?